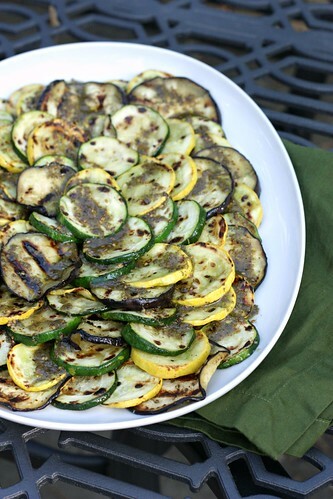 Grilled Vegetables with Za’atar Vinaigrette – Elly Says Opa! I mentioned recently that Zachary’s new favorite vegetable, until it inevitably got knocked out of contention, were broad/fava beans. Well, goodbye broad beans; zucchini with zaatar vinaigrette is in town. Z has always liked zucchini/summer squash well enough. Like most vegetables he prefers it roasted or grilled. He won’t eat the version they have at school, and I think that’s because it may be steamed. So, it wasn’t surprising that he liked this version, but it *was* a bit surprising that he ate 4 servings of it, and only stopped because there was none left. I added some lemon juice to the vinaigrette because I just feel like it goes so well with zaatar. The sumac will add some tartness already, but lemon vinaigrettes are the bee’s knees for me. This was a great side dish and a nice change of pace both from dressed salads and plain cooked vegetables. There is a good chance I will be dressing 90% of things with zaatar vinaigrette from now on. Slice the eggplant into 1/4″ slices and sprinkle with salt. Place in a mesh strainer over a bowl and drain for 30-60 minutes, turning occasionally to encourage the liquid to run off. Wipe dry. Slice the zucchini and squash and toss along with the drained eggplant, a little oil, and salt and pepper. Brush a grill or grill pan with a little oil and once hot, grill the vegetables, charring on one side before flipping them. Make sure not to overcook or undercook. Place on a serving platter as they finish grilling. Whisk the vinegar, lemon juice, and yellow mustard together. Whisk in the olive oil, zaatar, sumac, and salt to taste. Pour the mixture over the vegetables.